Each of the pre-built characters comes with their own paragraph of backstory, a bullet list of how they feel about each of the other team members, and what it means to them to be a part of the team that summits that mountain and goes down in history (or dies trying). Plus, Camp Three is split into three parts and no more than three players can be in each “tent” at a time. The weather is too dangerous to linger outside, so you have to be in a tent to discuss anything with anyone. This means you never really know what conversation is happening in the other tent(s) and who is angling for your spot on the last leg of the expedition. After the 40 minutes of negotiating and wandering from tent to tent, the expedition leader (one of the roles, not a GM) determines who is going to summit the mountain, with veto power from the team medic if they feel someone isn’t up to the trip for some reason. At that point, players submit one of two tickets off their character sheet to go with the summit team. These tickets are either boons or disasters for those climbing the mountain. The players receiving them formulate the end of the story off on their own at Camp Four, relaying their adventures via text message, phone call, or walkie-talkie. So the last twenty minutes of the game are a kind of radio drama, performed by the summit team up at Camp Four for a captive audience of the remaining members of the expedition stuck back at Camp Three, in character and huddled around their walkie-talkie. As a player, those first 40 minutes are stressful, up-close roleplaying. 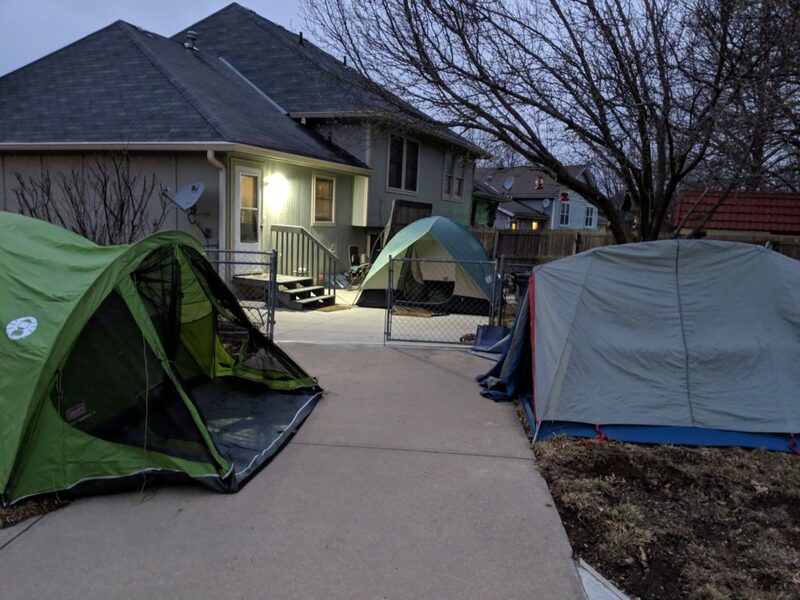 Our facilitator opted to pitch three actual tents in their backyard and we moved among those for the game, blasted by a serious windstorm that threatened our tents the whole game. (The original forecast was 32 degrees, but we got a break in the thunderstorms on either side and just got a wind advisory and weather in the mid-40s. It was helpful for staying in the moment!) By playing the characters against each other and leaning on the most advantageous of the inter-party conflicts, you can try to steer the conversation towards your own ends without making enough enemies that no one wants to see you with the singular honor of climbing that mountain. I lucked into being a member of the summit party, so I got to go inside with the other two members of the team and unwind a little, take off our coats and chat about what we were going to do next. Getting to build the end of the story using the six tickets sent up with you is a bit of GMing, a bit of improv, and some good old fashioned storytelling. Depending on which six tickets you get, the end of the game can go very, very differently, so I won’t spoil any of them beyond saying we had to decide among ourselves if we would send back two of us without summiting the mountain, or if we were willing to kill off two of us and have a lone climber “succeed” in ascending Gangkhar Puensum. Mechanically, there’s not a lot to discuss: talk in small groups, angle for a favorable outcome, and then pick a ticket to send up the mountain. It’s how those elements come together that makes it an interesting experience: One of our players has played multiple times and still found elements he hadn’t personally experienced yet. The game works well with a bit of secrecy still intact, so I would advise against reading the whole document if you buy it yourself. Our facilitator was able to prepare most of the game without spoiling it for herself and got lucky in being handed the role she glimpsed portions of during the prep before the game. I think playing in its “proper environment” in tents and winter coats while a windstorm raged outside was a great experience, but I would still try it again even in three dorms rooms and a lounge or three rooms in an apartment. The weather did not make the game, it just made the game better. If you are interested in a low-rules freeform experience (but with a suitable volume of drama), consider checking out The Climb.